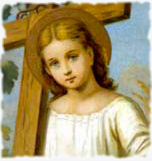 January 3, Most Holy Name of Jesus The name of Jesus is a name of gladness, a name of hope and a name of love. A name of gladness, because if the remembrance of past transgressions afflicts us, this name comforts us, reminding us that the Son of God became man for this purpose, to make himself our Savior. A name of hope, because he that prays to the Eternal Father in the name of Jesus may hope for every grace he asks for: If you ask the Father anything in My name, He will give it you. January 2, St. 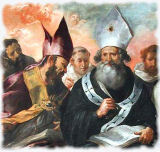 Basil the Great and St. Gregory Nazianzen In celebrating the feasts of St. Basil of Caesarea and St. Gregory Nazianzen on the same day, the Church extols a virtue which she has always esteemed, friendship. The friendship between Basil and Gregory was admirable. Born in Cappadocia around 330, they studied together in Athens and then returned to their homeland where they led a monastic life for several years. Their temperaments were very different. While Basil had the qualities of a leader and a gift for organization that made him a legislator for monks in the East, Gregory was a contemplative and a poet. Although New Year’s Day is not celebrated by the Church, this day has been observed as a holy day of obligation since early times due to the Solemnity of Mary, Mother of God. Each family and country has different traditional foods to eat on New Year’s Day, with lentils being the main superstition: ill luck befalling those who do not eat lentils at the beginning of the year. New Year’s is a day of traditional hospitality, visiting and good cheer, mostly with a secular view, but there is no reason that this day, too, could not be sanctified in Christ. May God bless and keep you in 2015. A quick reflection about my own year in 2014 makes me wonder where has the year gone? To be clear, my year has not gone to the way of waste and non-productiveness, but the opposite. So much has been done that it can be a difficult task to remember them all. And the reflection of that busyness? I am seeing change for 2015. And I pray that it is what God continually wants of me. Also that the things I have done last year would have built and strengthen my resolve to work harder for the people I hold dear and love. This morning I will go to New Year’s Mass at Santa Teresita Catholic Church in an hour or so and offer my prayers and thanksgiving to God for keeping me and loved ones safe and present. I will pray for you too, the reader of my blog. December 31, Seventh Day in the Octave of Christmas The last day of the year is also the feast of St. Sylvester — bishop of Rome in 314. Constantine gave him the Lateran Palace, which became the cathedral church of Rome. Many legends exist about Sylvester. 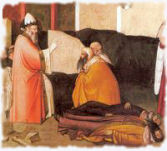 He supposedly cured Constantine from leprosy and later baptized him on his deathbed. December 30, Sixth Day in the Octave of Christmas God is your beatitude. The things of time are toys. You are eternity’s child and your eternity has already begun! There is a compelling urgency to every day and every hour of the day. In it we are to witness to the truth — that God greeted and gifted us at Christmas. If you know what witness means, you understand why God brings St. Stephen, St. John, and the Holy Innocents to the crib in the cave as soon as Christ is born liturgically. To be a witness is to be a martyr. Holy Mother Church wishes us to realize that we were born in baptism to become Christ — He who was the world’s outstanding Martyr. — Love Does Such Things, by Rev. M. Raymond, O.C.S.O. December 29, Fifth Day in the Octave of Christmas Given the tempo of the liturgical season with its feasts it is easy to overlook that one saint who for many centuries was, after Mary and Joseph, the most venerated person in European Christendom. St. Thomas Becket, Archbishop of Canterbury was assassinated in his cathedral on December 29, 1170 because of his opposition to his former friend, King Henry II of England, who was encroaching on the liberties of the English Church. December 27, Feast of Saint John St. John was born in Bethsaida, and like his brother James, was a fisherman. He was called while mending his nets to follow Jesus. He became the beloved disciple of Jesus. He wrote the fourth Gospel, three Epistles and the Apocalypse. His passages on the pre-existence of the Word, who by His Incarnation became the light of the world and life of our souls, are among the finest of the New Testament.